I first read this book in 2008, not all that long after it was released, pretty much in one go on a long haul flight. I recently came across it again, remembered the pleasure I derived from it the first time round, and so gave it a re-read. 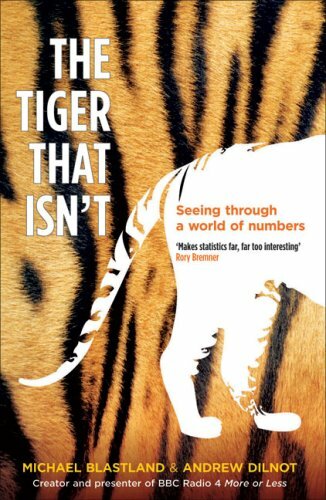 The Tiger That Isn’t provides a competent grounding in the very basics of statistical theory – risk, sampling, averages, etc – but does so in a way that is both relevant to daily life and, genuinely, laugh-out-loud funny. Blastland and Dilnot pick examples from many different spheres of life, but with a particular lean towards politics and the media, and explain the basic statistical errors underlying fallacious claims. They largely succeed in doing this in a lighthearted way, and attempt to equip readers with tools which might help them avoid similar mistakes in future. One suggestion that I remembered from my first reading of this book is that any Government spending announcement is more easily interpreted if one divides the headline figure by 3bn, which gives an approximation of the spend per member of the population per week. Of course, this book does not discuss statistical methods in great detail, and nor does it deal with some of the more complex statistical concepts. It does, however, give a good grounding in everyday statistics to those with a passing interest – I wish more journalists (and politicians) would give themselves a solid foundation of statistical understanding, and this is as good a place to start as any. I very much enjoyed my re-read of this volume, and would happily recommend it to anyone with even a passing interest in the topic. The Tiger That Isn’t is available now from amazon.co.uk in paperback and on Kindle. This 2,158th post was filed under: Book Reviews.